Say it isn’t snow. Snow, quite a bit of it, forecast for tomorrow. Fortunately we were right on track and only had a few chores left to get done this morning. We decided to go ahead and put the Christmas lights up now, but I promise we won’t turn them on for a few more weeks. 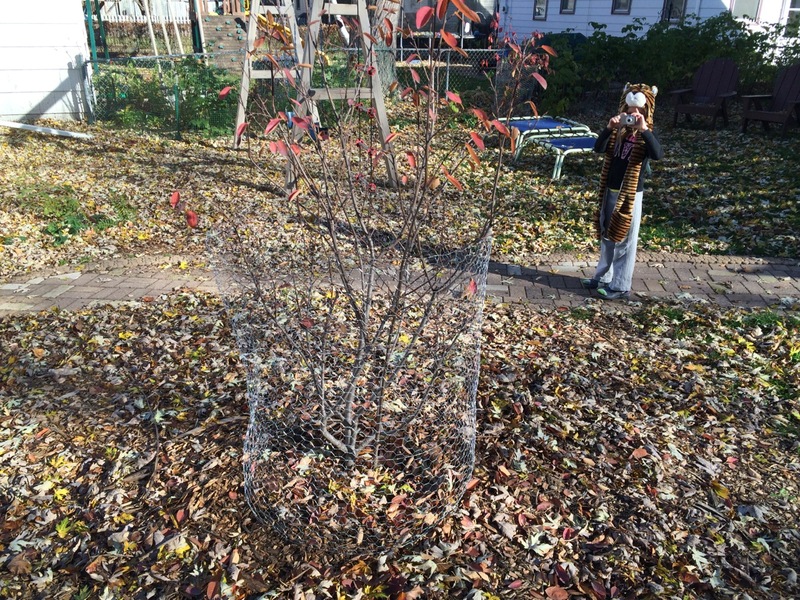 One thing on my list: I put chicken wire cages around each and every shrub in my landscape. They look ugly but it is the *only* surefire solution I have to prevent rabbit munching. Two years ago, they ate a few of my shrubs clear to the ground. This is my brand new Serviceberry; I’m not taking any chances. 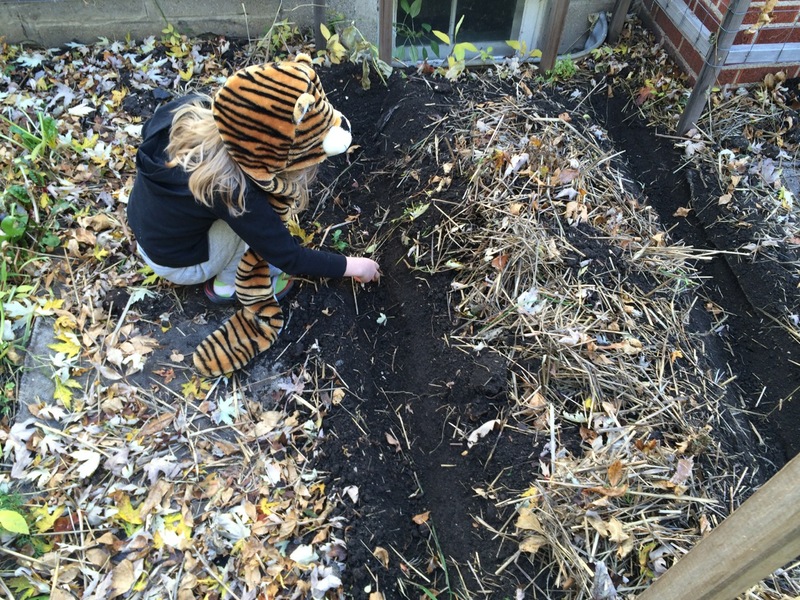 We also planted garlic that same morning, two weekends ago. I was glad that I ended up not having time to plant garlic until late October; it was a warm month. The general rule of thumb in Minnesota is to plant after Columbus Day, but one year I didn’t get it in until late November and snow was falling on my head as I planted it. And it was still fine. After taking a 2013-14 off from garlic, I’m very excited to grow it again. We went on a little getaway to the Ely, MN area over MEA break in mid-October. 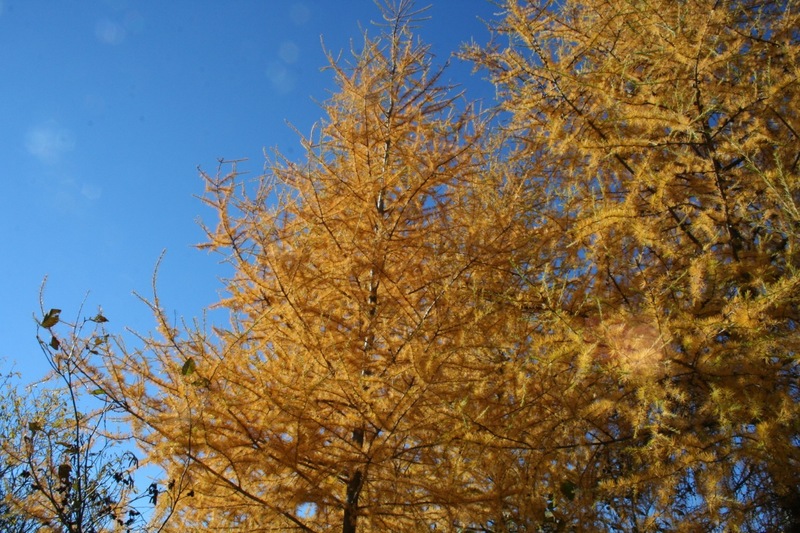 I thought any chance of fall color-gazing would be past, but the tamaracks ended up being at their golden peak. We had beautiful weather, cold but sunny, and took the kids on some trails that we hadn’t seen in more than 10 years. It was wonderful vacation, too short as always. Our first hard freezes of the year didn’t really come until the very end of October this year, around 5-6 weeks later than “average first frost” (really there’s no such thing in MN, but the official first frost date in the Twin Cities is September 21). 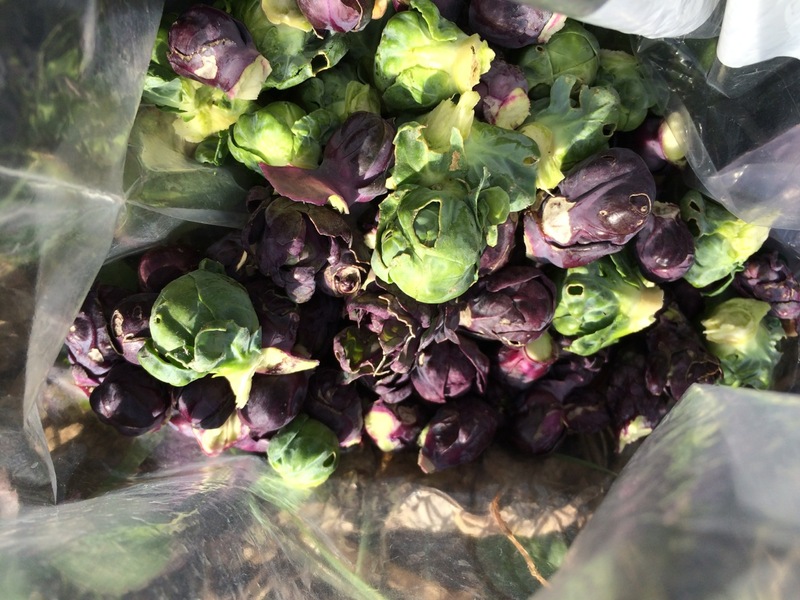 So I only picked my brussels sprouts last week. They were tiny but tasty. I ran back over to the community garden today to get a last large picking of kale, collards, and parsley before everything gets covered with snow. 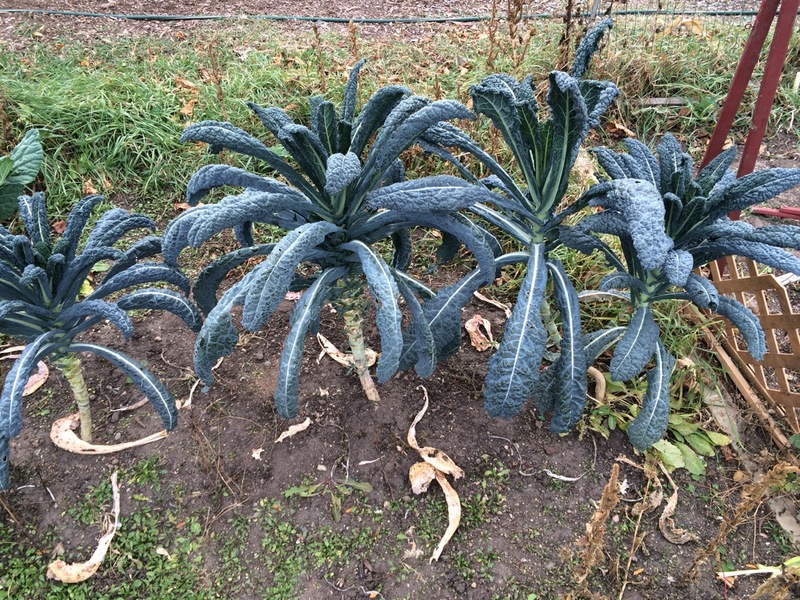 Sadly, this was a sight all over the garden: kale, brussels sprouts, and collards, all at their most gorgeous (and delicious) point but unlikely to ever get picked. The vast majority of the garden has been empty of people for more than a month now. It’s worth mentioning: if you plant frost-hardy plants such as these, expect to extend your harvest into November, and give thanks for it. 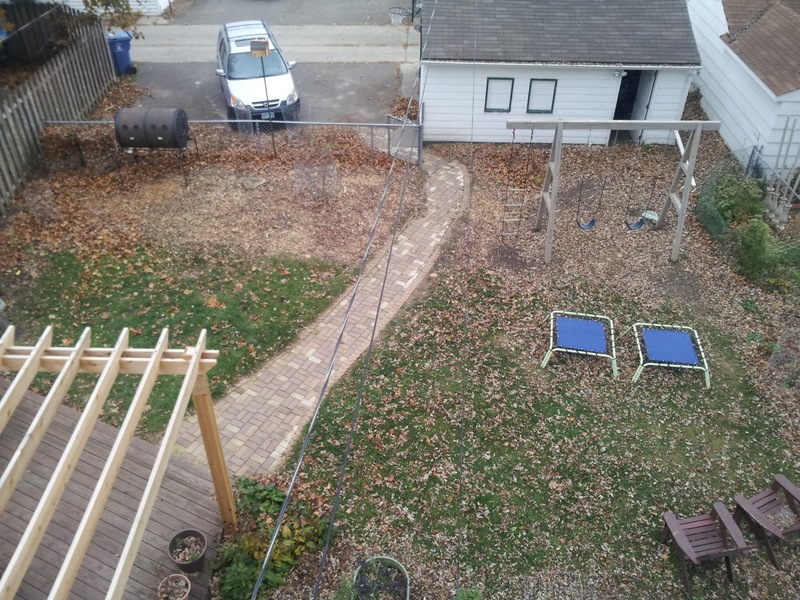 Adam cleaned the gutters today and was kind enough to provide me with an updated photo of the back yard. It looks very empty without the apple tree. I hope the Serviceberry (Amalanchier canadensis, also called Juneberry), grows quickly! It’s in a brand new planting area between the path and the compost tumbler; I hope to add a few more shrubs there in the spring. I have big, booze-themed plans for my new trellis, too. What to do with all the kale I picked today? Easy. Kale chips. We ate them all afternoon. 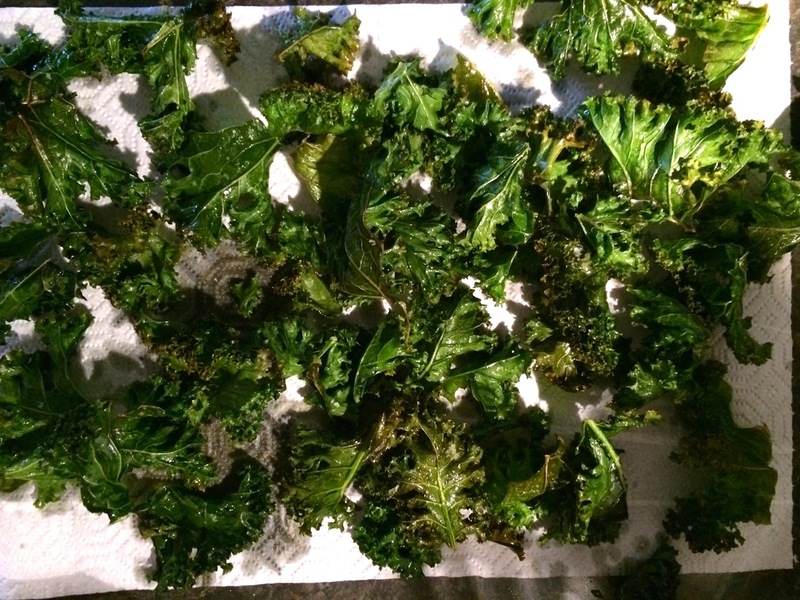 Toss dry kale leaves with a bit of olive oil and kosher salt, bake in a single layer on a cookie sheet for 10-15 minutes at 325 degrees F. Watch them closely because they go from perfect to burned VERY quickly. Delicious. Ready or not, here comes winter. Categories: Gardening, Practical | Tags: edible landscaping, kale, landscaping | Permalink.